PhilBoxing.com >> News >> List of Articles >> Reylan Loberternos: The Manny “Pac-Man” Pacquiao Confessions: Things You Might Not Have Heard Nor Read Before! 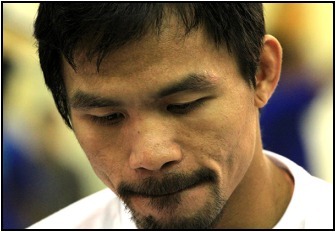 The Manny “Pac-Man” Pacquiao Confessions: Things You Might Not Have Heard Nor Read Before! Tagbilaran City, Bohol – As I was surfing TV channels exactly 8 years ago to look for whatever updates I might get for the then upcoming Pacquiao-Margarito encounter the following day, we luckily came across a one-on-one interview of Manny Pacquiao by Nancy Mirafuentes in her program “Wake Up Call” on CCTN, a local Catholic channel. We’ve never seen Pacquiao as spontaneous, as candid, and as amusingly talkative as he was in that interview. Here, we are going to discuss some of Pacquiao’s subtle confessions in the relatively lengthy dialogue done in a combination of three languages (English, Tagalog, and Visayan). Pacquiao’s rags-to-riches story has been told a million times. His journey to Manila, several hundred miles away from home, as a teenager is a topic often mentioned in various accounts of his life. But it was only in that interview, as far as my knowledge is concerned, where he shared a very personal spiritual encounter that, according to him, basically changed the course of his life. The streets of Metro Manila was a tough place to be without parental guidance, practically alone in an unforgiving environment so far away from home. Peer pressure and immaturity led him in a dangerous path towards drug use and vices at a very young age. He later on said that being under the influence of drugs was a horrible experience. He was always in doubt… not trusting anyone… always frightened and fearful of everyone. He considered everybody as his enemy who might be planning to harm him. One fateful night, he confessed of having an encounter with the Lord in a dream. In that dream, he said he was crying profusely when he heard a voice echoing through the mountains that essentially said “I love you… please come back into my arms.” When he woke up, he realized his pillow was wet and he was indeed crying, not just in his sleep. After that experience, he said that he immediately started to avoid joining his friends who influenced him to take drugs. This paved the way for a dramatic turn to what would become a legendary life. NEITHER CONFIRMING NOR DENYING MEANS THERE’S REALLY SOMETHING? The interview also touched a very sensitive issue that Pacquiao almost always chooses to avoid – reports of him having a child from another woman. The interviewer asked him in a casual manner whether there was any truth to those reports or not, to once and for all put the issue to rest. Pacquiao was giggling when he said he didn’t want to talk about it. Unwittingly, the interviewer didn’t actually get what Pacquiao was trying to say and assumed that it was a denial of the reports. She then faced the camera and said as if telling Manny’s wife Jinky that she no longer had any reason to worry about, when all of a sudden, Pacquiao interrupted her and said he’s not denying nor confirming the reports. He said it was possible, but he’s not sure and he didn’t want to talk about it. The mood was very jolly and funny, as they moved on to another topic. TORRECAMPO’S KNOCKOUT PUNCH WAS TO THE CHIN! It was also the first and only time I’ve seen and heard Pacquiao finally settle the long standing debate about that punch that he suffered against Rustico Torrecampo, the first boxer who put a dent on his boxing record. A lot of friends and colleagues suggest that it was a body punch. I and a few others have always maintained that it was a shot to the chin. The rather poor quality and camera angle of the available videos of that fight and the lack of answers from Pacquiao himself compounded the issue. When reminded by the interviewer and asked how he felt about his first loss, Pacquiao said he got careless and got caught with a perfect shot, saying “diri (here)” pointing to his chin. He then said that after absorbing that loss, he went back to working in a construction site, before deciding to lace his gloves once again. The discussion then came to his earnings. When asked what he did to his first earnings in boxing, Pacquiao said that he sent them to his mother Dionesia to help pay for his brother’s schooling. When he was earning more money, he said that he bought a house for their family and also donated some to renovate their chapel. When asked whether he has helped some of his former foes inside the ring, he said yes and politely declined to discuss further about his philanthropic endeavors. He said that he feels as if he’s committing a sin if he speaks of the charitable things he’s done and would rather keep them between him and his God. Pacquiao, though devastatingly dangerous inside the squared circle, is truly is a man of faith.